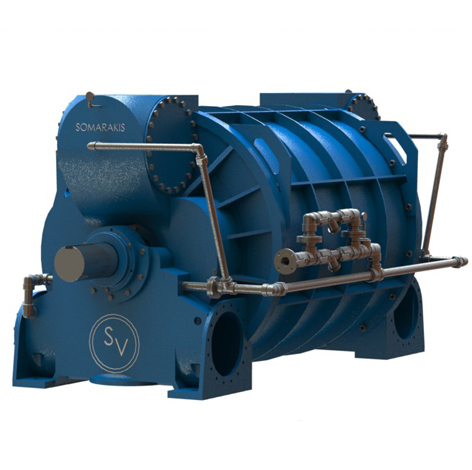 Somarakis | How Big of a Vacuum Pump Do I Need? How Large Of A Vacuum Pump Do I Need? Vacuum refers to a space where the density of the gas is less than the density of the air in the environment around it. This density is expressed as gas pressure. At sea level the air pressure is defined as 14.7 psia. If you have a container that is at a lower pressure, it is said to be a vacuum. To move gas from the container and expel it into the general atmosphere, one must compress the air from the low pressure state to the higher atmospheric pressure. The machine that does this is a vacuum pump. (For extremely deep vacuums the mechanism is not compression but individual molecule capture, see the description of the Entrapment Pumps below.) The vacuum pump can also discharge above atmospheric pressure, in which case it is called a compressor. When looking for vacuum pumps, there are many options to consider depending on your needs. Before settling on the given size, it is first important to understand the different types of pumps available for selection and what they can be used to achieve. • Positive displacement – these pumps function by pulling gas from a confined space into the pump chamber, sealing the chamber, compressing the air, and then opening the chamber to the vessel (or open atmosphere) that receives it; and then repeating. • Momentum transfer – these pumps use high-speed rotating blades or compress the gas out of the chamber and create a vacuum. They are commonly referred to as “blowers”. • Entrapment pumps – these systems basically capture air molecules in adsorbed or solid state and include getters, ion pumps and cryopumps. 1. Diaphragm pumps – These are positive displacement pumps that are quite small. Typical vacuum levels achieved can be as low as 5 psia, but not much lower. 2. Piston pumps – These are positive displacement pumps that can achieve 0.5 psia. They are usually bigger than the diaphragm pumps but do not have the capacity that can be achieved by the Liquid Ring Pumps. 3. Liquid ring vacuum pump – this is the most commonly used positive displacement pumps in the market. They have a chambered rotor which rotates inside of a pump body but eccentric to the body center. The pump body contains liquid which is thrown by centrifugal force to the outside of the body thus creating a liquid ring. The liquid advances and retreats inside of the rotor chambers creating the pumping action. A more complete description of this pump will be done in a subsequent article. These are the largest vacuum pumps and can achieve 1.5 psia in a single stage and .5 psia in a dual stage. 4. Rotary vane pump – these designs can either be dry (without lubrication) or oil filled. The dry options are very durable and consist of carbon vanes that will wear down slowly pulling up to 1 psia. The oil filled designs have an oil reservoir for lubrication and can pull up to 0.5 psig. 5. Scroll pump – this is the highest speed dry vacuum pump available in the market. Scroll/spiral compressors are they are commonly known use two interleaving scrolls that pump gas. These systems are more common for heaters and air conditioners with limited use for vacuum formation. What is the best vacuum size pump? The vacuum pump does two things: it reduces the pressure below atmospheric and it moves gas. The size of the vacuum pump is determined by both how deep the vacuum you need and how much gas is in or is going through the chamber (or leaking into it). We commonly see three types of applications. If you are evacuating a space, you will need to know how big the space is, what level of vacuum you need, how fast you want to achieve the vacuum, and the anticipated leakage into that space. If you are running a process, you will need to know the throughput of the process and the compression across the vacuum pump. If you are running a filter, you will need to know the vacuum desired and the porosity of the filter. For the common applications, for instance a dairy for milk machines or a dental office for the suction used there, you simply buy a pump from one of the reputable manufacturers. If you have a custom application you can contact us and we can quickly determine your needs. All pump manufactures publish performance curves which show the capacity of the pump versus the vacuum achieved. You can also check these documents if you care to size the pump yourself.